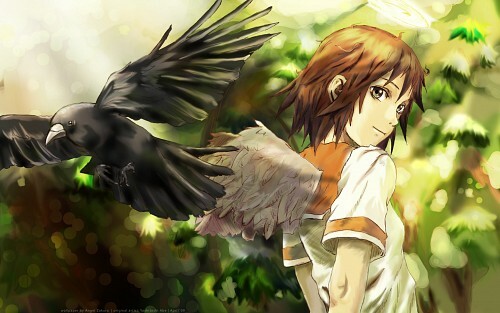 Haibane Renmei Wallpaper: free birds. Minitokyo »	Haibane Renmei Wallpapers » Haibane Renmei Wallpaper: free birds. Hmm……I'm a fan of sketchy lines but I think you could make each stroke longer so that they flow a little better, and I prefer painting that is less smudged. But otherwise the atmosphere is quite pleasant. Nice job. Ahhh i remember this wall from AP! This is certainly one of your better walls! Those colors blend nicely to create a lovely atmosphere. I remember seeing this on AP a long time ago, even before I became a member, but because it's one of your older wallpapers, I never knew that you were the one who created it. I have to agree - this is one one of your best. It certainly deserved every bit of attention over at AP, and I can't wait to see all of the love it'll get here. I love your painting style in wallpapers, and that style and how it was executed here, to me is perfection. The lighting, the atmosphere, the composition - so fantastic, I've got to use it as a desktop. I don't remember what I said when I first commented on this, but it looks even more amazing after all this time. Oh how I love this. It's still one of my favorites mainly because it really gives off a nice feeling, that and the sketchiness. It's simply beautiful. Thank you for this great wall. I love this pic. Thanks for the up.